Twitter summary: Dr. Ed Damiano presents impressive results at #ATTD2014 from bionic pancreas trials – lowering average bg and reducing hypo! This February 6, Dr. Ed Damiano shared the much-anticipated results from the 2013 Beacon Hill and Summer Camp outpatient studies of the bionic pancreas at the 7th International Conference on Advanced Technologies and Treatments for Diabetes (ATTD). We can say that even among a conference full of exciting new technology, these results stood out as exceptional. As background, Dr. Ed Damiano and Dr. Steven Russell’s bionic pancreas is a closed loop system that takes readings from a Dexcom G4 Platinum CGM, feeds them into a control algorithm running on an iPhone, and ultimately directs insulin and glucagon dosing through two Tandem t:slim pumps. 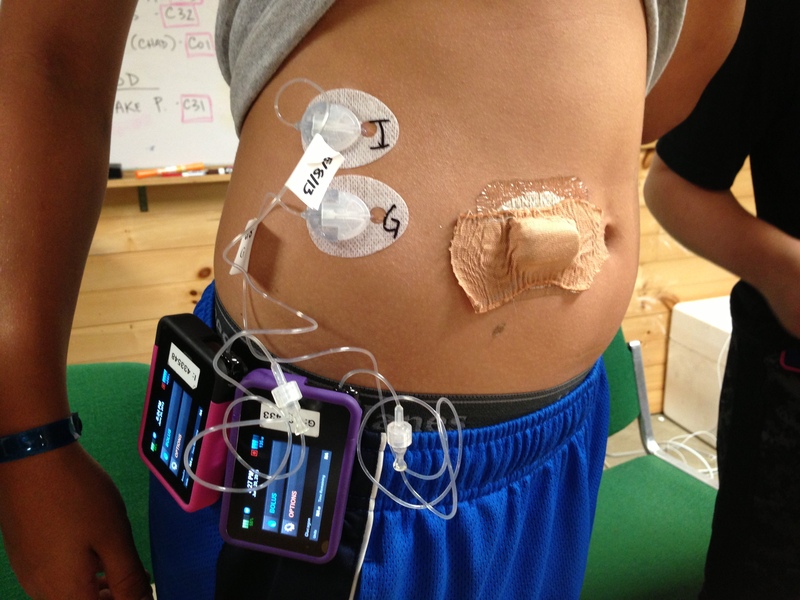 diaTribe’s Editor-in-Chief, Kelly Close, participated in the five-day Beacon Hill bionic pancreas study, and we wrote about the five-day Summer Camp study of adolescents 12-20 years old just last year. We’ve been following this exciting new technology very closely – you can read our last update on the bionic pancreas here. In Dr. Damiano’s presentation, the bionic pancreas dramatically improved average glucose levels (predicted to result in a 0.9-1.6% A1c reduction!) AND nearly eliminated hypoglycemia (just <2% of the time spent <60 mg/dl) compared to when patients were not wearing the bionic pancreas (the “control” or “usual care” group). Those results are unheard of for any diabetes drug or device. In addition, the comparison to the control group was very challenging, as patients received far better care at the study sites than they would normally. The tables below summarize the results of both five-day trials. On the left is the average glucose, A1c, and hypoglycemia rate while patients wore the bionic pancreas. On the right is the same data for the exact same patients when they were not wearing the bionic pancreas. * Data in the table show combined data from days 2-5 during each study – the first day is excluded because the device must adapt and learn about the patients during that time and does not reflect the rest of the time spent on the bionic pancreas. The strong results are a very encouraging sign of the potential of the bionic pancreas. However, there is still much to be done to realize Dr. Damiano’s goal of having the bionic pancreas on the market by 2017 (when his son with type 1 diabetes goes to college). We described some of these challenges previously – most importantly, the development of a dual-chambered pump (insulin and glucagon) and a stabilized glucagon. We’re glad to see progress on this front, as the bionic pancreas team is currently working with their industrial partners to create a dual-chambered pump platform and conducting trials for a stabilized glucagon candidate. However, large and long enough studies must be conducted with the system to convince regulatory authorities that these systems are safe and effective and can be worn by thousands of patients without close supervision. The upcoming timeline is to begin a four-center, 12-day study in adults, which will take place at Massachusetts General Hospital, Stanford University, the University of Massachusetts Medical Center at Worcester, and The University of North Carolina at Chapel Hill. The study is expected to start this spring and will run until early 2015. Participants must be students or employees of the centers and will be able to sleep at home and go through their daily routines. In other words, the bionic pancreas will control their blood sugar while they go about their normal lives. Very real world indeed! The researchers also plan on conducting another camp study in the summer of 2014 in 6-11 year olds at Camp Clara Barton for girls and Camp Joslin for boys in Boston. We imagine that camp slots this summer are already filling up fast! With the recent approval of the Medtronic MiniMed 530G (read our test drive of it here), all of us at diaTribe have been thinking a lot about the road to an automated insulin delivery system. What new challenges will have to be overcome? How quickly will chronic use of glucagon be approved? How will patient use of the device evolve? Will we be able to see these systems on the market five or 10 years down the road? Although it frequently seems that progress cannot come quickly enough on the diabetes front, the data that Dr. Damiano presented on the bionic pancreas shows us that these devices are definitely worth waiting for. Interested in learning more about the latest product and research news in diabetes? Sign up here and receive free updates on future diaTribe articles.